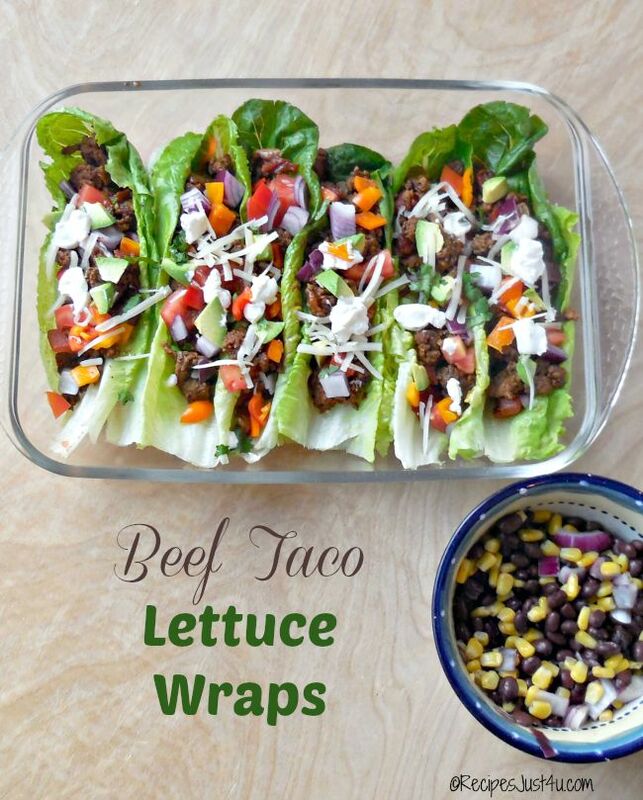 These healthy beef taco lettuce wraps prove that healthy eating is anything but boring at our house! These wraps make a great main course and is also one of my favorite easy appetizers. My alternative is a bright and colorful take on the normal recipe by using lettuce leaves instead of tortilla shells. Best of all these are one of my favorite 30 minute meals. When you are trying to watch your weight and eat in a more healthy manner, it sometimes seems that mealtimes are boring. But that does not have to be the case. We love tacos but want to cut carbs. 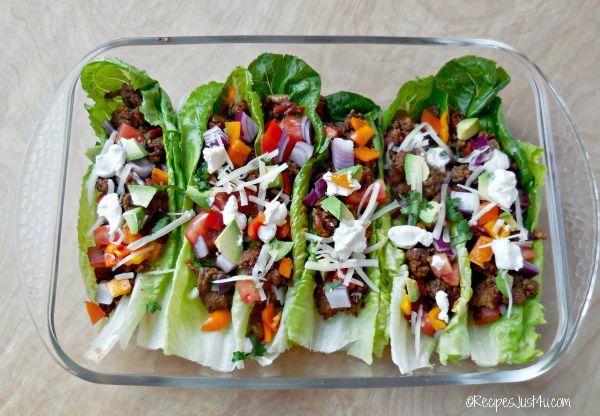 Treat your Family to these Healthy Beef Taco Lettuce Wraps. 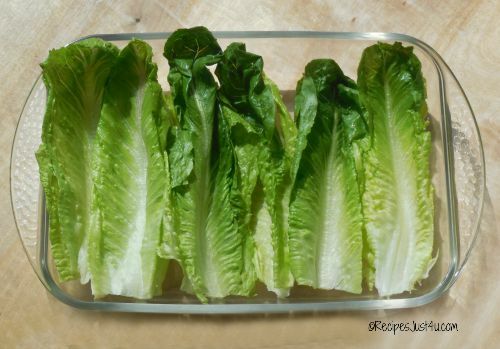 I used Romaine lettuce leaves and doubled them to make them more sturdy. They are the perfect size and shape to hold the fillings and their lovely green color compliments all the fillings beautifully. One of my favorite things about tacos is that the fillings really are up to you. Just about everything you can add to a taco is somewhat healthy. Feeling like extra fiber? Add some black beans. Want more healthy fats? 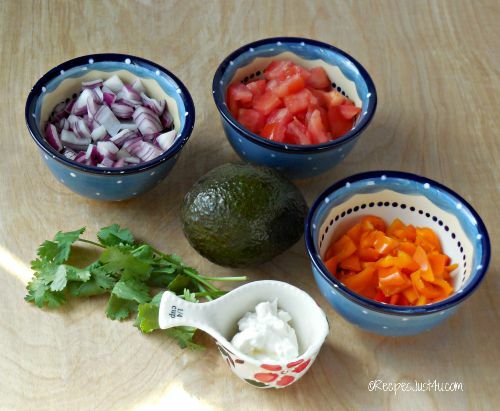 Add some chopped up avocados. Lower fat cheese such as Cabot reduced fat cheddar lightens the calories and still tastes great. And of course, lettuce, tomatoes, and chopped sweet peppers all add a wonderful bit of healthy carbs as well as loads of color. I made my own taco seasoning, rather than using packaged mixes (which taste too salty for my taste). It is simple to make from ingredients that you probably have on hand. The Romaine lettuce leaves fit perfectly into my serving dish. Be sure to use some inner leaves. They hold up better than the outside ones. I made 6 tacos with this recipe. Perfect to serve 3 hungry people or a starter for 6. This meal is so easy to make and is on the table in a flash. It takes just a few minutes to prepare and then a few more to cook. Spoon it into the shells and serve. Healthy eating done the right way! Doesn’t this platter look fantastic? Your family will love this new way to do tacos. I served this with an easy side dish of black beans, corn and vidalia onions. Perfect accompaniment and the whole meal was very filling too. This recipe is healthy cooking at its best. It is gluten free and if you omit the cheese and sour cream, it’s also Paleo and Whole30 compliant. Heat the olive oil in a non-stick skillet over medium-high heat. Add the onion and saute for 2 minutes. 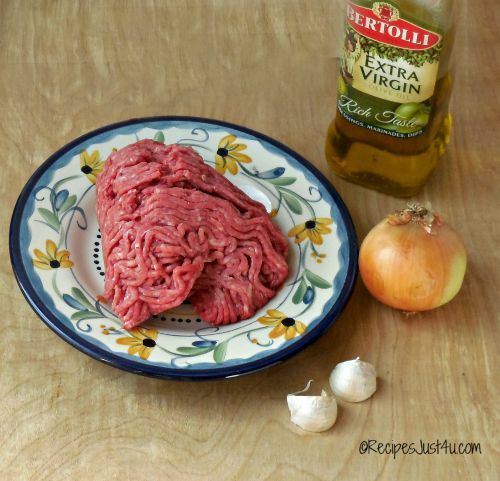 Add the ground beef and garlic, season with salt and pepper, and cook, breaking up the beef occasionally, until cooked through, about 5 minutes. Add the taco seasoning, tomatoes and chicken broth. Reduce to a simmer and cook about 5 minutes until the sauce has reduced. Spoon the mixture into lettuce leaves and top with your favorite toppings.